Finding gold is a real challenge. This is what makes it so valuable. Research : Research can be 90% of your success. It is easy and a lot of fun. Research will guide you to the best gold producing areas within a particular region. Your research should consist of reviewing old records from a region viewing maps, reading books, talking to local people and finally checking local libraries, information centers, government geological surveys, state universities with mining programs and historical societies. 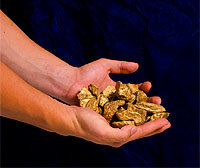 Ask Others Who Know : Your local detector supply shop will be familiar with the gold fields in your area. Ask about local prospecting clubs you can join and inquire at your State Mines Department. A. Virgin Ground : This is an area of ground which was never worked by the old-time prospectors. This may have been because the area was not rich enough to warrant the labor or was just not ever discovered. Virgin areas are often areas around the fringe of known, worked goldfields. B. Surfacing : This is where large areas of ground have been removed from several inches to several feet deep. These are usually located in areas of shallow ground and can be easily recognized. These were areas of rich gold deposits in their day. C. Shallow Diggings : This is where the gold rushes of the early 1800's took place. Small shallow shafts were dug with pick and shovel, the gold-gearing gravel on the bottom was then processed. These diggings tended to follow the lowest points in an area, like gullies... They are very fertile prospecting areas and generally, due to poor equipment, the old miners discarded more gold than they found. D. Deep Leads : These are ancient river beds that over time have been buried. There are both ‘deep’ deep leads, search mainly the waste material from a mine. When detecting 'shallow' deep leads, search both the waste material and the ground in between. There are a number of advanced techniques that will help you to increase your gold yield in an area, while also help you to remember an area's location. A. Gridding : This technique involves dividing an area into a number of small grids and thoroughly sweeping each grid slowly and methodically. In dry country, it is common to see detector operators dragging a chain behind them so they can easily see the line of their last sweep. This is particularly useful in dry desert country. B. Marking : This involves tying colored ribbons or string to trees to mark an area where you previously found gold. Also try to mark these spots onmaps to ensure that you can return to them at a later date. The use of pocket-size Global Positioning Systems (GPS) can be used to plot and store your position to within a few meters. C. Traversing : When detecting a hillside or slope it is often better to detect across the slope rather than up and down. This gives a greater chance of cutting across a 'gold run'. These 'runs' are gold nuggets, which have broken off their source and carried downhill by gravity and erosion. Gold Weight Table : Gold is weighed and sold in Troy ounces which is a heavier weight than the Imperial ounce.